THE KINGS OF SUMMER is a marvellous, joyful coming-of-age movie that has shades of Wes Anderson in its whimsy and nostalgic evocation of summer and teenage romance but ultimately has it's own clear and unique tone. Kudos to Jordan Vogt-Roberts on his feature directorial debut, and in particular to screenwriter Chris Galetta, who successfully combines larger-than-life quirky characters with real stakes to create a movie that's both funny and dramatic - that is both silly and contains profound truths about friendship and how children relate to their parents and each other. The premise of the film may seem a little farfetched when written down but the movie is so strong you just go with it: two high school friends, Joe (Nick Robinson) and Patrick (Gabriel Basso) are so disaffected by their parents in typical teen angst that they decide to build a kind of super-tree house in the forest outside their town and simply leave home. Much to their annoyance they're joined by that kid we all knew at school - the one who's determined and weird and slightly creepy - Biaggio (Moises Arias). As one would expect - it all starts of cool - they have fun and larks and subsist on farmer's market chicken but it all falls apart when the girl Joe likes goes off with Patrick, and Joe, in a fit of pique, rebels against Patrick's strict rules and ruthless nature intervenes. To say more would give away an ending that contains genuine peril and the triumph of Biaggio in one of the most wonderful father-son pieces of dialogue in recent cinema. The wonderful thing about this film is that you genuinely care about the kids, and sympathise with their need to escape, while at the same time feeling for their parents. You simultaneously want them to succeed and to be found. It captures completely that feeling of teenage invincibility - that you can achieve anything - as well as the proud stupidity of those years. There's a magic and wonder and behind that a naivety and risk - and this movie captures all of those facets in a deeply entertaining way. Not to be missed. 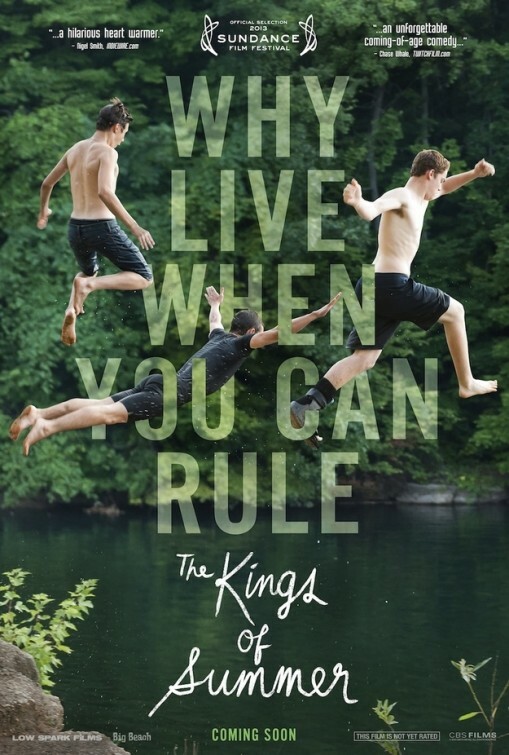 THE KINGS OF SUMMER is rated R in the USA and has a running time of 93 minutes. 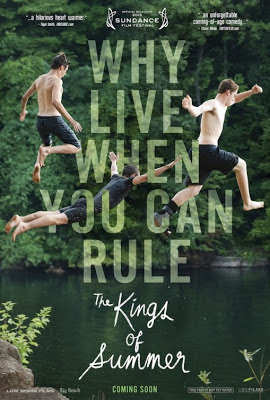 THE KINGS OF SUMMER played Sundance and Sundance London 2013 and opens in the USA on May 31st.